Israel is carrying out murderous assaults against protesting Palestinians, with its armed forces killing and maiming demonstrators who pose no imminent threat to them, Amnesty International said on Friday. 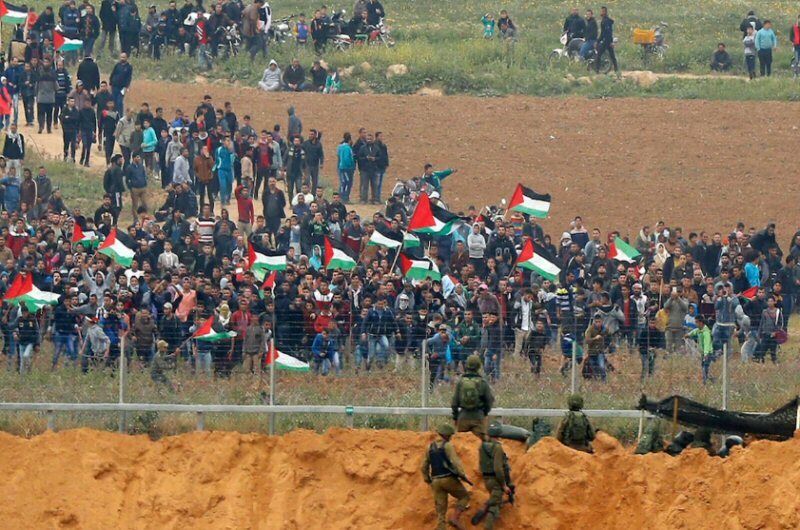 Based on its latest research, the famous rights group said, Israel continues killing and maiming protesters as the “Great March of Return” protests continued in the Gaza Strip. The Israeli military has killed 44 Palestinians and injured more than 6,122 others – some with what appear to be deliberately inflicted life-changing injuries – during the weekly Friday protests that began on 30 March. “For four weeks the world has watched in horror as Israeli snipers and other soldiers, in full-protective gear and behind the fence, have attacked Palestinian protesters with live ammunition and tear gas,” Deputy Regional Director for the Middle East and North Africa at Amnesty International Magdalena Mughrabi said. “Despite wide international condemnation, the Israeli army has not reversed its illegal orders to shoot unarmed protesters,” she added. “The time for symbolic statements of condemnation is now over. The international community must act concretely and stop the delivery of arms and military equipment to Israel. “A failure to do so will continue to fuel serious human rights abuses against thousands of men, women and children suffering the consequences of life under Israel’s cruel blockade of Gaza. The USA is by far Israel’s main supplier of military equipment and technology, with a commitment to provide $38 billion in military aid over the next 10 years. But other countries, including EU member states such as France, Germany, the UK and Italy, have licensed large volumes of military equipment for Israel. In most of the fatal cases analysed by Amnesty International victims were shot in the upper body, including the head and the chest, some from behind. Eyewitness testimonies, video and photographic evidence suggest that many were deliberately killed or injured while posing no immediate threat to the Israeli soldiers. Over the last 11 years, civilians in the Gaza Strip have suffered the devastating consequences of Israel’s illegal blockade in addition to three wars. As a result, Gaza’s economy has sharply declined, leaving its population almost entirely dependent on international aid. Gaza now has one of the highest unemployment rates in the world at 44%. Four years since the 2014 conflict, some 22,000 people remain displaced.